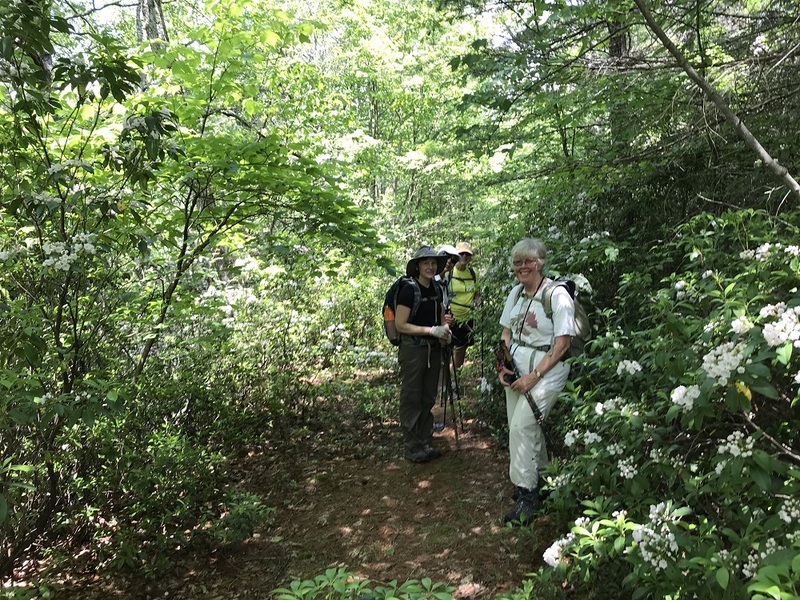 The Corbin Mountain Hike rescheduled from April 7 (due to inclement weather) was attended by 8 hikers including Marian Styles, Debra Fisher, Marie Moss, John Brandt, Nancy Handley, Jeanne & Dan Ralston, and hike leader, Marit Anderson. Marian set up car pools from AHS and others arrived from different locations at 10 am at the Old Rag lower parking lot. The place was packed, but fortunately overflow parking at the nearby neighbors was still available. Of course, the majority of folks were headed for Old Rag, so our set hike up Nicholson Hollow was relatively empty. 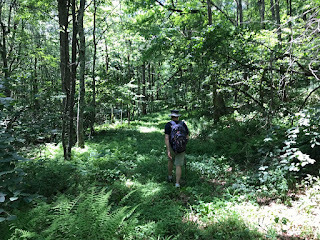 Our path took us into the Shenandoah National Park along the Nicholson Hollow Trail with the lovely Hughes River next to it. 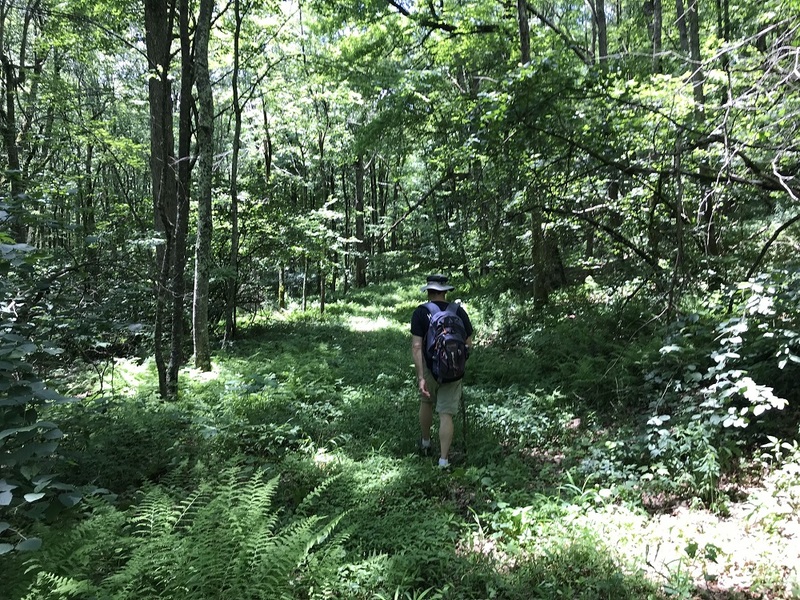 We arrived at Corbin Cabin about 2 hours later and 4 miles in. Lunch and chocolate was enjoyed by the river...with many of us soaking our feet in the delicious, cool water. 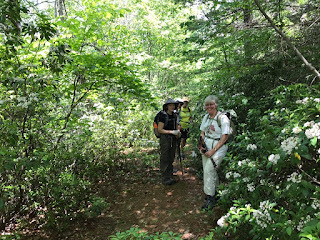 Marian and Debra took the shorter route and backtracked to the parking area to make it an 8 mile trek. 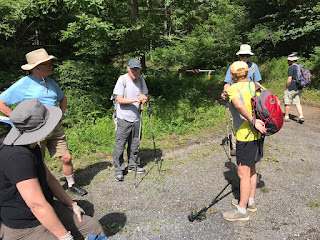 The rest of the group continued on the 11 mile circuit on Indian Run Trail, to the Corbin Mountain Trail, then along the Old Rag Fire Road, following Corbin Hollow Trail along Brokenback Run, and finally back down the Weakley Hollow Fire Road. At this point we got to join the throngs of Old Rag returnees and watch the Forest Service Safety personnel zoom up towards the Old Rag area. We never found out if there were injured hikers, but we were hoping it was not anything serious. 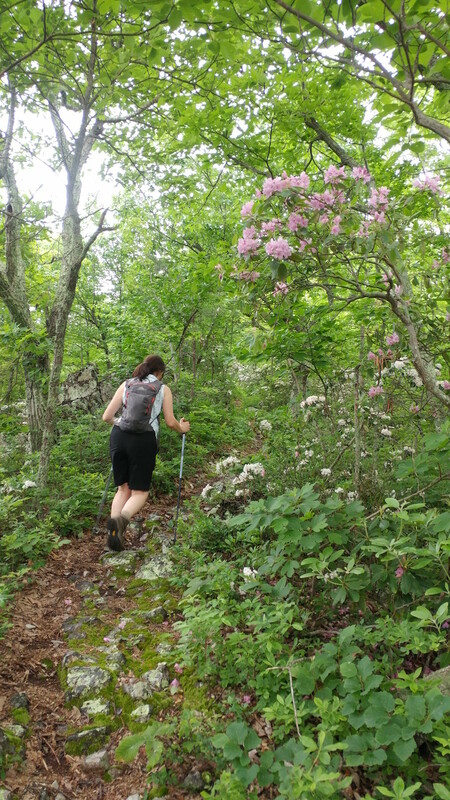 The temperature at the cars was in the mid 80's, so we were grateful the Corbin Mountain Hike had been in the shade, with 5 water crossings and gurgling water sounds a good part of the day. 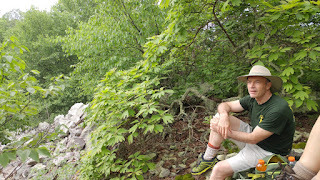 The elevation gain for the day was 2,370 ft., much of the incline on the Indian Run Trail. A few of the group members stopped by Sharp Rock Winery for wine tastings on the way home. A special thanks to Marian for helping car pools and other logistics. 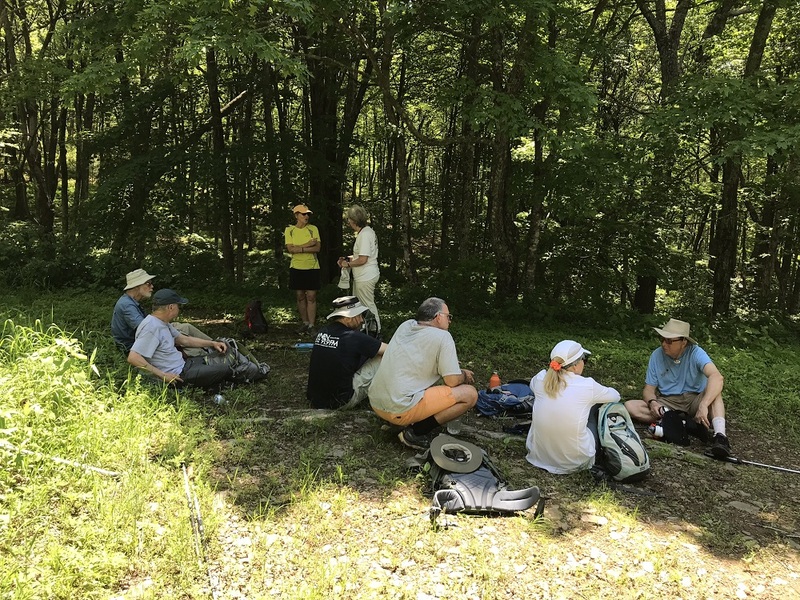 The hiking group of Marian Styles, Brian Muszynski, John Brandt, Suzanna Williams, Nancy Handley, newcomer Dan Cox, and hike leader Jeff Monroe joined veteran Valley Chapter members Lynn and Malcolm Cameron, and Michael Seth for a nine mile hike south on the Shenandoah Mountain Trail from U.S. 250. 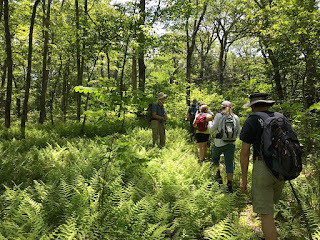 There were few views and no waterfalls along the way, but the group was amazed by the many wildflowers and large fields of ferns under large trees. This is a part of Shenandoah Mountain that gets much less hiker activity, compared to parts further north in Ramsey’s Draft Wilderness, and the group marveled at the health of the plant communities along the hike, with very few invasives. Lynn showed off her amazing knowledge of the area by directing the group to a hidden trail that connected the Benson Run Trail back to the Shenandoah Mountain Trail. Hastening the return were threats of lightning and rain, but the group escaped any heavy downpours. 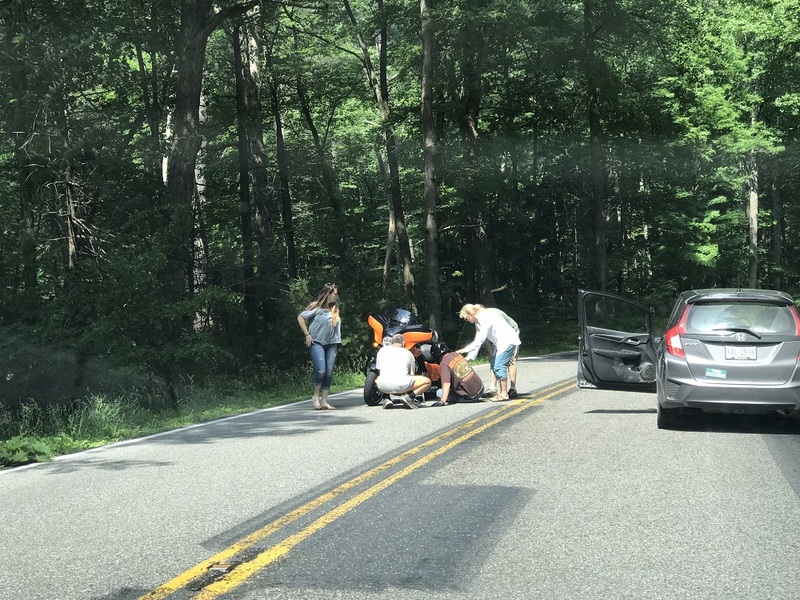 On the drive back both vehicles stopped for a motorcyclist who had fallen off of his bike on US 250 near the base of Shenandoah Mountain. John and Suzanna helped other passing motorists get the bike off of the rider as it had pinned him to the pavement. The rider claimed to be ok, and all were on their way. On a Saturday morning threatening rain, five intrepid hikers, Jocelyn Prostco, Paul Henderson, John Brandt, Iva Gillet and Marie Moss, joined hike leader Barbara Martin on the Torry Ridge Trail. We climbed up into a glory of mountain laurel trees and some rhododendrons. Jocelyn discovered a spotted salamander. We all enjoyed lively conversations with each other. We had lunch at a rock fall, sitting on moss and lichen-cushioned rocks, sheltered by a blooming rhododendron. As Paul and Iva consulted their phones to see the likelihood of rain, Barbara looked at the blackening sky and saw the wind picking up and made her own prediction. Shortly after turning around to go back it started to pour, accentuated by booms of thunder. Jocelyn wondered if it would rain buckets and then indeed it did. She had her first experience of hiking in the rain and getting completely soaked. All maintained good cheer as we made our way at a brisk pace back to the cars. Thoughtful Iva had brought plenty of towels for the drowned hikers to dry off with. Driving home we saw homes and yards completely flooded by the South River. We congratulated ourselves on not being fair weather hikers!